27 October 2013 Updating of meeting dates (past meetings) New 2014 programme not yet confirmed. 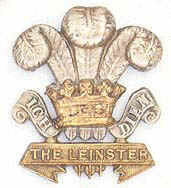 21 August 2913 New date for the London Ordinary General Meeting and announcement of date 21 September for ceremony in Birr for the unveiling of the memorial to The Leinster Regiment at Crinkill, Birr, Co. Offaly, Ireland. Video from Remembrance Ledegem we now have some video footage from Remembrance Ledegem, the clips are being uploaded as they are edited. Video 1 - the march into Ledegem. The Prince of Wales's Leinster Regiment (Royal Canadians) Association is proud to have received the honour of being able to parade in Ledegem, West Flanders, with Colours* flying, drums beating and bayonets fixed, and this privilege was duly exercised on the 12 October 2008.